Mr. Dalton is a member of the firm’s Real Estate Section. His practice primarily focuses on commercial, agricultural, industrial, and residential real estate matters throughout the country. He represents clients in all aspects of development, including acquisition, due diligence, financing, zoning, entitlements, leasing, and sales. Additionally, Mr. Dalton has extensive experience in corporate, construction, and probate and estate law, as well as representing clients in complex civil litigation matters. 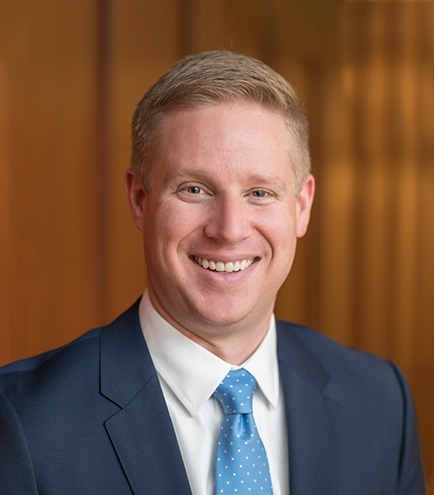 Prior to attending law school, Mr. Dalton worked in corporate finance and real estate development, specializing in ski resort and golf course projects. He is a graduate of the University of Iowa College of Law and received his undergraduate degree from Brigham Young University in Business Management (Corporate Finance Emphasis), with secondary studies in civil engineering. Served as counsel of record for a publicly-traded bank advising it regarding compliance with TRID regulations for all residential real estate loans and title matters. Represented a commercial developer in acquiring, entitling and developing part of a $90 million mall redevelopment project. Prepared loan documentation for over $50 million in financing for retail developments and historic mixed-used redevelopment projects in Iowa and Wisconsin. Structured a sophisticated management agreement for independent operator of national hotel chain franchise. Served as Director and Legislative Chair of the Greater Iowa City Home Builders Association. Served as Commissioner of the Morgan City Planning Commission and Park City Affordable Housing Committee.